Falling remains by far the number one cause of injury among seniors and accounts for almost all (90%) of hip fractures and more than half the head injuries. A recent study done at Simon Fraser University here in Vancouver and recently published in the Lancet has looked at how and why seniors tend to fall. Cameras in long term care facilities provided the data. Analysis showed that 30% were due to either a trip or being bumped off balance. The majority of falls (70%) however resulted from a failure at a basic daily activity such as walking, going from sit to stand or even just quiet standing. The common fault was an incorrect weight shift taking the person’s center of gravity outside their balance zone resulting in a fall. That can happen easily with a turning motion, when reaching for something or attempting to go from sitting to standing. People often got their arms out for protection. Arm strength was frequently insufficient to absorb the impact and still allowed hip and head strike to occur. The side-step saving reaction was sometimes obstructed by the furniture design. Furniture designed on a central pillar rather than with legs could help reduce falls. 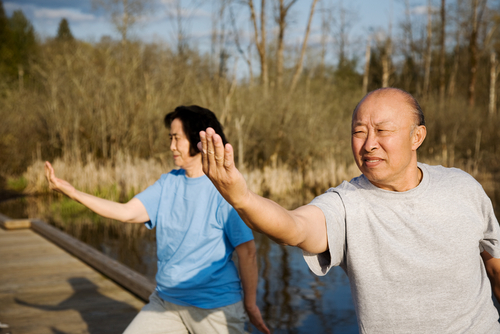 Overall the study to me emphasizes the need to maintain strength and balance for as long as possible. 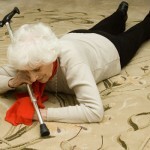 Both to reduce the number of falls but also to minimize the impact (pun intended) of those that do occur. This entry was posted in Avoiding Injury, Men's Health, Osteoporosis, Senior's Health, Women's Health. Bookmark the permalink.